Instructions: Make a card base from white card stock. Cut two pieces measuring 8 inches by 8 inches and another 8 inches by 8 1/2 inches. Score the second piece on the 1/2-inch mark. Apply glue inside the 1/2-inch flap. Put the first piece of card stock inside this flap. Fold and secure well. Cut a pattern paper with green background from paper collection 1/4 inch smaller than the card base. Adhere on the card front with clear clue. Cut another mat layer 7 1/2 inches by 7 1/2 inches from white card stock and distress the edges with Plum Archival ink with sponge daubers. Adhere on the first mat layer with clear glue. Cut pattern paper 1/4 inch smaller than the second mat layer and distress the edges with Plum ink. Add this layer on the card front. Cut 6 inch by 6 inch photo mat print from the paper collection. Remove the inside area and keep the frame. Stamp the background love image in embossing ink on vellum paper that is 6 1/2 inches by 6 1/2 inches. Add white embossing powder and heat set with heat tool. Adhere the frame on this and attach it on the card front with foam tape. Cut a decorative die and add to the left side of the frame. Cut a corner from the die set and add to the top right of the frame with clear glue. Stamp the petit flowers on vellum paper with embossing ink and add white embossing powder. Heat set and cut with matching die. Shape a little with groove golf tool. Add stamen in the centre. 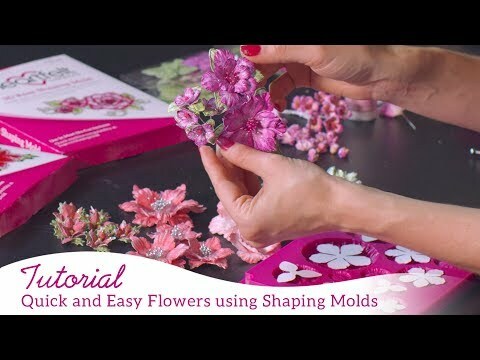 Make similar flowers in white card stock using plum ink and cut with matching die. Shape in the petite flower shaping mold. Stamp the Rose images in Plum ink from Classic Rose stamp set on white card stock. Colour with same colours and Cut with coordinating die and shape in the Rose Shaping mold. Make many small roses. Add glitter on them. 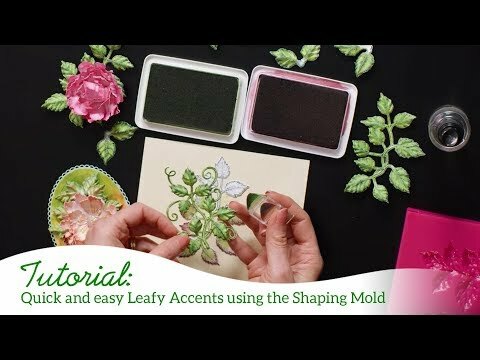 Make Leaves from Leafy Accents set and give them shape using the groove golf tool. Stamp the corset image in Plum ink and punch holes as per image using the crop-a-dile. Weave satin ribbon trough the holes. Stamp the floral dress and mannequin in plum ink. Cut with matching die and adhere together to make the complete dress. Stamp the hat and cut it with matching die, and add to the dress. Adhere the complete dress on the card with foam tape. 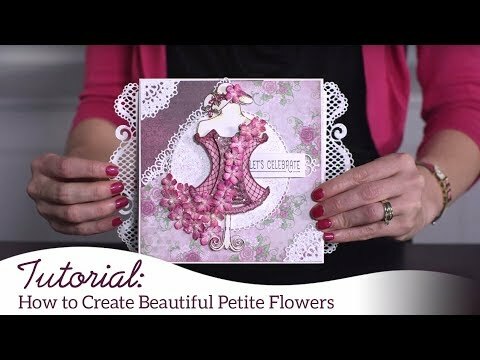 Arrange the flowers and leaves on the card front.